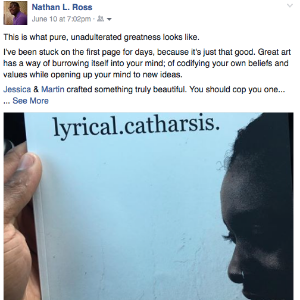 As my book approaches its TWO MONTH anniversary, I wanted to give a shout-out to some of the people who have their own copy of “lyrical.catharsis.” and have supported me thus far. I shed a thug tear as I compiled some of these images. Being a poor, independent writer is HARD. Being horrible at self-promotion makes it worse, especially when people are like, "poetry? an unknown writer? $15?!? NOPE. NOPE. NOPE." But there are some readers out there who thought enough of me to add my words to their collection. You’ll be like, “I was walking with you Jess." But anyway, here are some of the people who have supported me! I cannot say thank you enough.